Two seven year olds and a shiny new double-edged shaving blade. Yikes. Then I got a call from Amit. I frowned at my phone. It was on silent, of course. He knew I was in induction, why was he even calling me? Though etiquette strongly advises against it, I took the call and muttered a brusque “what” into the phone. I gathered my stuff, scattered my wits, and left. It is a testament to my driving skills that I got to the hospital before Amit did. Since both of us were driving, we couldn’t talk (much) but from a spate of What’sApp messages (which, of course, it’s quite alright to do while driving) I gathered that blood and tears had started flowing around 3.30 p.m. Ignorant of the cause or extent of injury, Amit rushed the child, Tara, to the pediatrician next door. He put a dressing on the wound and adjured Amit in no uncertain terms to get the patient to pediatric emergency pronto. Amit drove out without even going back home, with Mrini in tow of course. I saw his handkerchief later in the hospital. It had been used as the first line of defence and it was … a bloody mess. And I mean that literally. Well, I had handed off my car for valet parking as soon as I got to the hospital. It was scary, though. It had a bunch of original documents – educational certificates, work experience certificates, the lot of them – which I had carried along for the joining day formalities. I tried to stuff them into a bag and take them along, but no dice, they wouldn’t go and I was too hassled to do anything calmly, so I sent up a prayer and handed over the keys. Well, a very handsome young intern took a quick look at the wound. I was there and I almost fainted – and I’m not particularly the fainting type. It was pretty gory, the left index finger had pretty much come apart at the topmost seam. It wasn’t hanging by a thread or anything like that, but it had a clear rift. The dressing our friendly next-door pediatrician had put was soaked in blood and the handsome young guy was tugging it off with such gusto I was surprised Tara wasn’t hollering her head off, but she was strangely calm. Of course, we found out later that she had managed to sever the nerve, so perhaps that explains it. Anyway, the handsome young intern said the tendon was cut and surgery would have to be done tomorrow morning, be here at 6.30 sharp. Then he wrote up a number of blood tests, an xray (just to be sure the bone was ok), an admission certificate and whatnot, and cheerily sent us on our way. We ran around trying to get everything done and work out insurance details while also trying to convince ourselves that this surgery was really unavoidable. 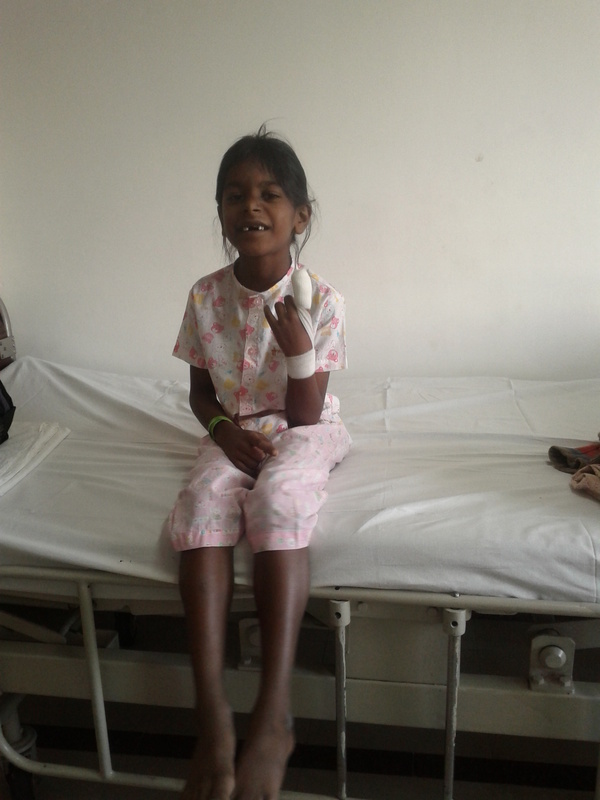 In the end, we left the hospital around 6.30 and went straight to another doctor, an orthopedist with a private clinic, for a second opinion. It was close to 8 by the time we got to see the doctor. He didn’t – thankfully – want to look at the injury. As soon as he heard about it, and especially when he heard that she was unable to bend the finger at that joint, he agreed that the tendon was probably cut, that surgery was certainly required, that a plastic surgeon would have to do it, and that this particular doctor in this particular hospital was known to him and was good. In a bit of a daze, we left the clinic, grabbed a bit of dinner, and went home, where I was greeted by pools of blood on the floor, the kitchen sink the stairs, and the bathroom sink. In the midst of cleaning that and putting the kids to bed, I noticed a shiny new shaving blade on the floor. It took another 12 hours of questioning and examining to get the truth out of the kids. Getting the shaving blade from Amit’s collection had been Mrini’s initiative, after which she had, supposedly, gone to the bathroom. Slicing her finger open was Tara’s own initiative. They both knew they should not have had anything to do with a blade, so they denied the matter till they were blue in the face. It was only when she was about to go under the surgeon’s knife the next morning, that Tara finally admitted to Amit what had happened. Till then, she had rather unconvincingly maintained that she didn’t know how she got cut, that she had “forgotten” that she had been just “playing” and finally – when we didn’t seem to be buying any of those – that she had crushed her finger on the edge of the cupboard. This last one we actually half believed for a while. Until we found the blade and spied a tiny smear of blood on one edge. The day of the surgery crawled by in a haze of waiting. 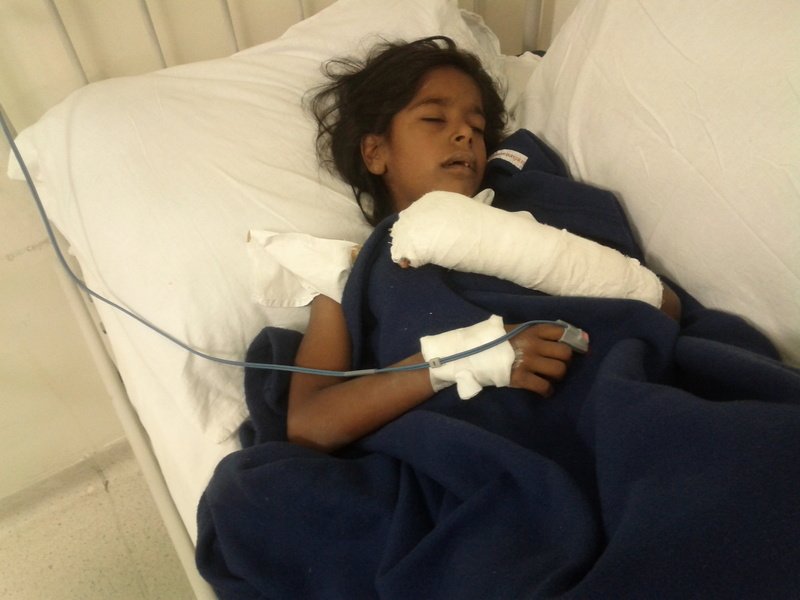 Amit took Tara to hospital, while I packed Mrini off to school. I reached hospital around 8.30, by which time the patient had been sent into the OT. She emerged around 9.30, still sedated. The rest of the day went by in watching her awaken, watching her spirits return, watching her retch, watching her eat, watching her want to walk, then play, then sleep. The surgeon said the tendon had been cut and the nerve as well. Both had been fixed, but would take time to heal. The finger tip would tingle and prickle and itch and pain as the nerve repaired itself. The tendon required immobilization to heal. 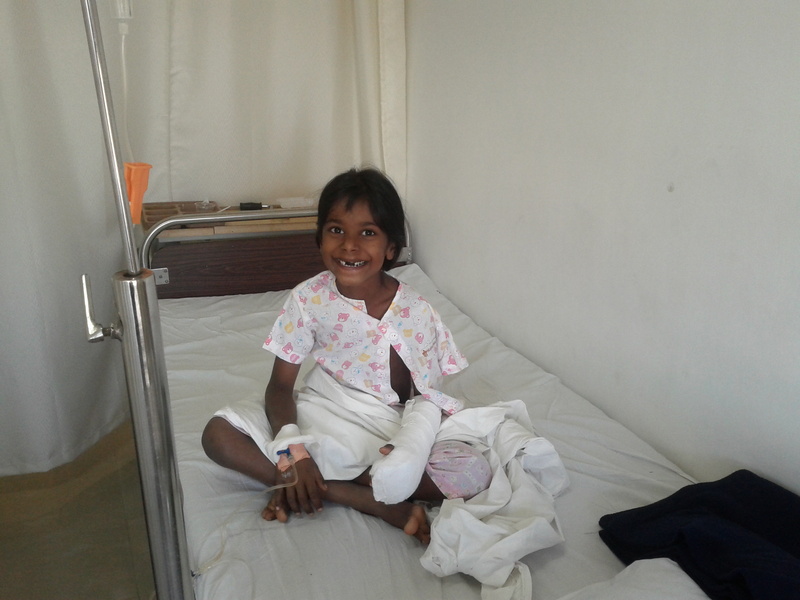 She had a cast that ran from fingertips to her elbow and it would stay for a month, he said. And then there would have to be physiotherapy. But all’s well, nothing’s broken that can’t be fixed. The day after surgery, Amit handled the discharge, while I returned to my new job and the interrupted induction. It’s not the kind of first-day-at-work that I’ve been used to. It’s not a kind I’d want to repeat. But well… two seven year olds and a double-edged blade. It could have been worse. You are currently browsing the The Twins & I blog archives for December, 2013.